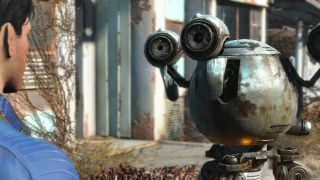 Several videos showing gameplay footage from Fallout 4 have leaked onto the web, more than a week before the game is set to launch. Needless to say, spoilers lie ahead. Four videos were uploaded to video site vid.me and have been racking up views by the thousands since being shared on Reddit. The videos give us a look at the beginning of the game, along with some more action-heavy sections from later on. If you want to go in with fresh eyes next week, avert them now. For the rest of you, you can see the videos below.